These little bites are incredible. I used onions but you could substitute grated carrots if you don’t care for onions. Easy and quick. These would be great for football gatherings too. Heat the oven to 400. Spray mini muffin tin with the olive oil spray. Finely grate the zucchini and drain. I placed the zucchini between paper towels and squeezed until the most of the liquid was out. Add all the other ingredients and mix thoroughly. You can add any other spices you would like. Chives and carrots have been a tasty alternative i’ve tried. 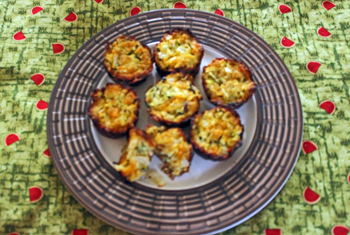 Spoon in to the sprayed muffin tin and bake for about fifteen minutes or until done. They should be browned on top and mildly firm. If they aren’t cooked enough they will stick to the muffin pan. That’s it. Now don’t eat them all on the way to the table. Chop the garlic and the onion and set aside. Cook the pasta to al dente and the asparagus about three minutes. Rinse the asparagus in cold water and set aside. In a skillet heat a couple of tablespoons of olive oil. Add the sausage, red pepper flakes, onions and garlic and cook thoroughly. Next add the red wine vinegar and the balsamic vinegar. Continue cooking over medium heat. Add the heavy cream, salt and pepper. Stir and reduce the heat to low. Cook about two or three minutes and then add the asparagus and parsley. 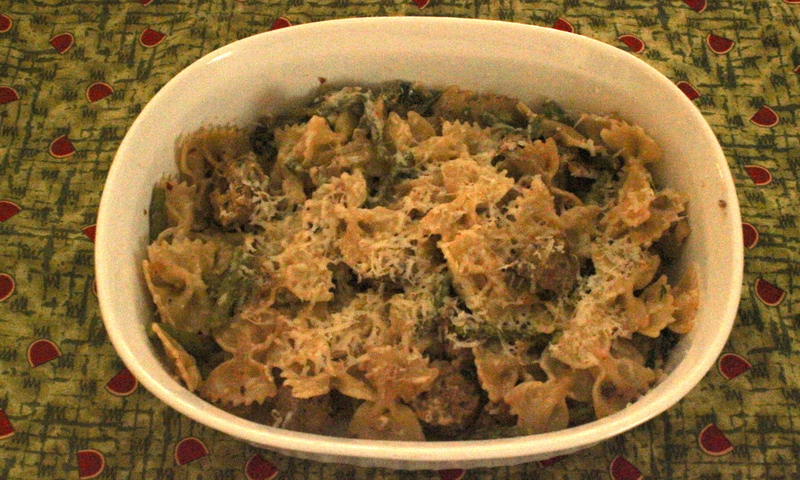 You can add more sausage or asparagus if you wish to this dish. Place in to serving dish and grate Parmesan Reggiano cheese on the top. Enjoy! Planning a Wedding or Just a Toast? Last year my son was married. It was a spectacular October wedding outside. The theme was country and since we have had so many requests on where to get some of the items I thought I’d pass along some information. The napkins were made by my company, Country Loving Market. They were 15 x 15 and reversible. We do accept custom orders and offer large volume pricing. 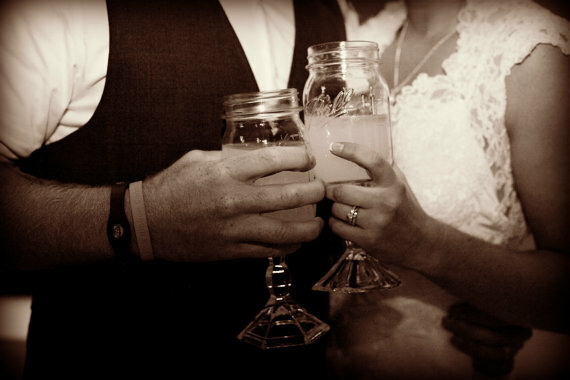 The toasting glasses are make by Back Home Country Acres that can be found on Etsy. Another post on putting food away for the winter. Why? It’s healthier…when you freeze your own food you decide what is quality and you know how it’s actually been handled. Today I’m freezing carrots, organic carrots to be exact. These are the regular full size garden carrots not the baby ones. Here is what I have found to be the best method. Peel the carrots and wash them. Slice the carrots and blanch them in boiling water for two to three minutes. Next, scoop them out and place them in ice water for about five minutes. After that place them in a strainer for a few minutes to drain off as much water as possible. Place them in freezer bags and put in the freezer. They keep pretty well for up to a year. To have to try this. It’s awesome. Peel and grate the zucchini and lightly salt. Remove as much moisture with a towel or paper towel as possible. Add all the other ingredients except the oil and mix thoroughly. Heat the oil in a skillet. Drop the zucchini mixture by large spoonfuls in to the skillet of hot oil. (Watch yer self here so you don’t get burned.) Flatten slightly. Cook slowly about 6 to 8 minutes on each side to a lovely brown. Turn and repeat cooking on the other side. Drain on a paper towel. Eat up! 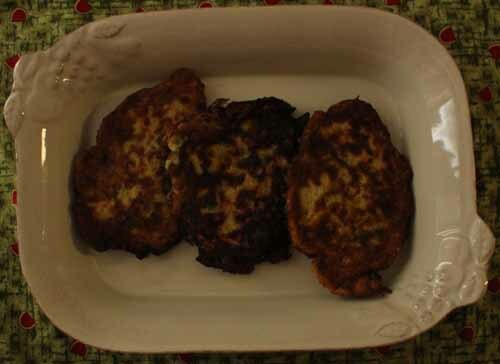 These are great as a side for fish or chicken or add some cheese on top and use it as a main course.